In December's podcast, Family Financial Feuds "To Show or Not To Show", Camaya and I mentioned my friend and colleague Emily Koochel's work with the financial transparency scale. Emily Koochel is a PhD student at Kansas State University and a graduate teaching assistant in the Applied Family Science program. During our podcast, we mentioned Koochel's work on financial transparency, but like most podcasts, we went down a few rabbit holes and discussed a few other issues involving credit. I really enjoyed learning more about the research on financial transparency between married couples and thought our readers would too! Koochel used a few different scales to create a financial transparency scale. She states financial transparency is the "open and honest disclosure of one's finances." I want to point out that this research was done with never before married couples who had been married for 5 years or less. So newly married couples as well as couples coming up on their 5 year wedding anniversary! 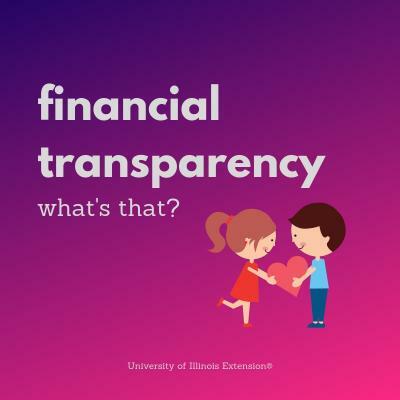 There had been very little research done on financial transparency with married couples and Koochel went on a quest to determine if the Financial Transparency Scale is statistically valid. *Spoiler alert*, it is valid, and hopefully will help financial planners, counselors, and others in the future to help create more productive conversations with couples about money. - The first 22 questions ask how often you have this financial conversation with your partners. The questions included reviewing financial statements, discussing how money should be saved or spent, as well as reviewing credit reports together. - The next 10 questions are really looking at financial secrecy between you and your spouse. These questions include lying to your spouse about a purchase or financial transaction, trusting your partner, having access to a partner's financial statements, and disclosing bonus and earnings. - The next 15 questions ask how often you and your partner engage in making plans for your money, goal setting, using a budget. The scale finishes up asking about fighting styles between husband and wife. Indicate how likely YOU are to do the following: Lie about a purchase to your partner. - Not Likely at all? Being transparent about your finances can be a tricky subject with your spouse. Full disclosure, I have lied about purchases in the past to my partner (sorry hubby!). Maybe I wasn't as honest about the price, or how I went about purchasing it. According to an online poll by Forbes Women and NEFE (National Endowment for Financial Education) 31 percent of us admitted to lying about their finances. Professionals can use the scale to help them with young married couples to see how transparent they are about their finances, maybe even before they get married! It could be a great check-in tool for older couples as well. If you want to learn more about Koochel's research, you can go online and read about validating the scale or even take the questions yourself. I'm looking forward to reading more about financial transparency, and I hope you enjoyed it too!